Filmmaker Shane Salerno dedicated ten years of his life to answering three questions about the elusive, yet famous writer, J.D. Salinger. In this interview with the writer and director of Salinger, find out what inspired Salerno, and what it took to find the answers. The director’s cut of Salinger, with 15 minutes of new material, premieres nationally Tuesday, January 21 from 9-11:30 p.m. on PBS (check local listings). American Masters: What was it about J.D. Salinger that made you devote ten years of your life to making this film? 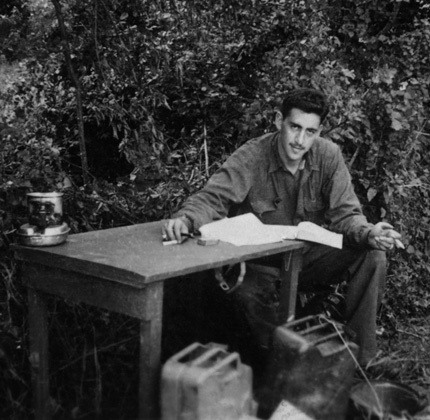 The only photo taken during World War II of Salinger writing “The Catcher in the Rye.” Photo courtesy of Denise Fitzgerald. Salerno: When I grew up J.D. Salinger was an important figure in my house. My mother had enormous admiration for him as a writer and introduced his work to me at a very young age. Like millions of readers I was captivated by Salinger’s voice. It was smart, funny and wickedly precise in its dissection of people. When I finished reading everything she gave me I asked her what else was available and she said that was everything, there was no more work. I assumed Salinger had passed away but then she told me about how he had stopped publishing in 1965 and was rumored to write every day in the woods of New Hampshire. I was fascinated by the idea of such a brilliant and dedicated writer walking away from publishing but continuing to write every day. One rainy day, many years later, I walked into a used bookstore known as much for its dust as its books and picked up a biography of Salinger. I learned from this book that Salinger grew up on Park Avenue but sought out service in World War II and fought to be accepted after he was initially rejected for service. I also learned that his first day of combat was D-Day and that he participated in some of the bloodiest battles of World War II. Prior to the war he had lost the love of his life to Charlie Chaplin and after the war he suffered a mental breakdown. There were so many fascinating parts of Salinger’s life that I was completely drawn into his story. When I finished the book I made the decision to make a film about Salinger. I wanted to explore the impact of World War II on his writing. World War II was the transformative trauma of Salinger’s life. Before the war he was a Park Avenue rich kid. After the war he was a battle hardened veteran suffering from post-traumatic stress syndrome perpetually in search of a spiritual cure for his damaged psyche. World War II destroyed the man but made him a great artist. Religion provided the comfort he needed as a man after the war but killed his art. There had already been over 100 books that dissected every word of Salinger’s writing. My film is about Salinger’s life and in telling his story we provide new insight into his work. I began with three goals: I wanted to know why Salinger stopped publishing; why he disappeared; and what he had been writing for the last forty-five years of his life. After a ten-year investigation, the film answers each of these questions. AM: Given how spare the visual record is of J.D. Salinger’s life how difficult of a film was this to produce? Salerno: It was extremely difficult. The challenges were enormous because J.D. Salinger never sat for an on-camera interview. There is no known audio recording of his voice. There were very few photographs available. This was not like making a documentary about Lance Armstrong, Ted Kennedy, John Lennon, Bill Gates or anyone like that where there is a wealth of visual and audio material to draw from. There were no press conferences. No Oprah, 60 Minutes or Johnny Carson interview to license. There were no family videos. There were also significant legal restrictions about quoting any of Salinger’s work that we had to follow very carefully after countless hours spent with teams of lawyers on both coasts. This was a ten-year investigation, a detective story. J.D. Salinger was a counter-intelligence agent in World War II and he lived his life after the war and until his death as a counter-intelligence agent. Convincing friends of Salinger to talk on camera that had never spoken on the record was incredibly hard. It took years. Finding photographs and letters and film footage that not even his family knew existed was like finding a needle in a stack of needles. This project took ten years of my life. I was thirty when I started and forty when I finished. I invested $2 million of my own money. The fact that we were fortunate enough for the film to sell for such a significant amount doesn’t change the risk that was involved initially. It was a tremendous risk. Buddy Squires, an Oscar-nominated and Emmy-winning cinematographer and producer who worked with me for ten years on Salinger told AP that “I have worked on more than 200 documentaries in my career, and Salinger was the most secretive and the most intense film I have ever worked on,” and I think that says everything. It was not easy and the secrecy involved which was required to make the film made it nearly impossible. In the final analysis, what really distinguishes our film and book project is access — access to Salinger’s friends, colleagues and members of his inner circle that have never spoken on the record before as well as film footage, photographs and other material that has never been seen. We take the viewer and reader inside J. D. Salinger’s private world and shine light on a man named Jerry who lived in the shadow of the myth of J. D. Salinger. AM: What is unique about the director’s cut? Salerno: This version contains new material, some of which came together after the theatrical release. There are entire relationships in this version that didn’t make the cut. There are new pictures. There are new interviews. There are alternate versions of scenes that ran in the theatrical cut and extended versions that provide new and important information. It is the most complete version of the film and I am grateful to Beth Hoppe at PBS and Stephen Segaller at WNET for allowing me to present this director’s cut. I am excited for it to debut as the 200th installment of American Masters. AM: The film received a largely warm response from major critics and fans but there were some who felt that it was an invasion to make a film about J.D. Salinger at all. How do you feel about that? Salerno: I was thrilled with the wonderful reviews from such notable critics as Kenneth Turan of The Los Angeles Times, Richard Roeper of The Chicago Sun Times, Claudia Puig of USA Today and a number of others. I knew from day one that making a film about J.D. Salinger would require stepping into the line of fire from certain critics. I understood and accepted that. There were a few critics that felt no one had the right to make a film about J.D. Salinger and I flat-out disagree with that. The foundation of that opinion is misguided and rooted in a false belief that J.D. Salinger was a recluse who left the world in 1965. Nothing could be further from the truth. Salinger was never a recluse and the film and book clearly prove that. He traveled the world, communicated frequently with friends and often came into New York to have lunches and dinners, see Broadway shows and pop backstage to introduce himself to the cast. He pursued young girls and he courted and dated Hollywood actresses, often by trading on his own celebrity. He frequently interacted with fans, obsessively followed how his work was presented and critiqued and aggressively perpetuated myths about himself. In short, he did everything that most journalists that have written about said he despised. The reclusive label has no basis in reality but it is an extremely powerful myth. Salinger was extraordinarily private and the film and book show that a major reason for that desire for privacy was due to his attraction, pursuit and dating of very young girls. I have enormous respect for Salinger as an artist but I wholly reject the idea that he deserves an entirely different standard for biography than Martin Luther King, John F. Kennedy, Thomas Jefferson or Oscar Schindler. If you were making a film about any of those men you would tell the great accomplishments of their life as well as personal failures and that’s what I did with Salinger. I had an obligation as a filmmaker to tell the full and honest story of his life and some people had a problem with that. I understand why people are so protective of Salinger. Most readers first find Salinger at such a critical point of their life, as a teenager or in college or just after college when they’re really trying to figure the world out, and he is a seminal figure in their life. He was an important figure in my life. But for some people it goes beyond the work, it goes to him. They ascribe the purity of his writing directly to him as a person, and they ascribe a protectiveness as a result, and so they’re fiercely loyal as readers and fiercely loyal as guardians of Salinger, and I respect that. I am a lifelong fan of Salinger’s but I am also a filmmaker and it was my both my job and also my responsibility to make an honest film about his life and that meant exploring things that were uncomfortable and in some cases unflattering. I didn’t spend a decade of my life on this to tear him down and in fact the film has brought an enormous amount of new readers to Salinger’s work and caused earlier fans to pick his work back up. As a direct result of the film, The Catcher in the Rye shot to number seven on Amazon, a position it has not reached in many, many years and I’m very proud of that. AM: Why did you select American Masters? Salerno: There were three reasons. First, American Masters is an extraordinary series and has been for nearly three decades. It really is the gold standard of documentary filmmaking. Its longevity and relevance is a credit to Susan Lacy who created and executive produced the series and the incredible team of people she assembled. Second, Susan’s persistence and Stephen Segaller’s commitment to the film was remarkable. They were terrific partners. Finally, I believed from day one that J.D. Salinger belonged on American Masters. AM: In addition to the film you have also co-written (with David Shields) a 700-page biography of Salinger that was a New York Times bestseller. How did the book come about? Salerno: During ten years of investing the life of J.D. Salinger I found far too much material to ever fit into a two-hour film. There were critical letters, diary entries, photographs, background material and certain documents and other research that were better simply suited to a book than a film. 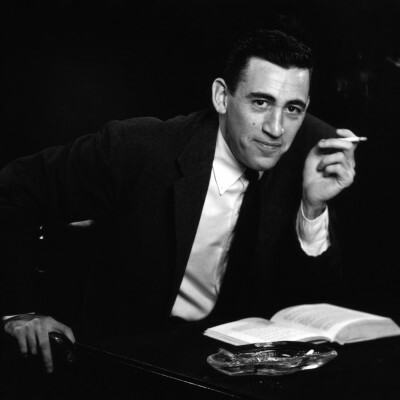 I hired David Shields to work with me on the book and the result is the most thorough examination of Salinger’s life and work that has ever been written. AP said the book was “unprecedented…and thoroughly documented” and Entertainment Weekly said the book was “as close as we’ll ever get to being inside Salinger’s head” and I think that was a testament to the decade of journalistic work that went into writing the book. The book also made every major bestseller list from The New York Times to NPR and was a #1 Los Angeles Times bestseller. The book serves as not only a foundation for the film but also as a deeper exploration of Salinger’s life for fans of the film. AM: Ten years later, what are your final thoughts about Salinger and the making of the film? Salerno: I am very proud of the film and the book – very proud that it led to three separate partnerships with American Masters, The Weinstein Company and Simon & Schuster. I am grateful the film was received so well, particularly by a number of major documentary filmmakers, and that the book was a bestseller. I have received a lot of wonderful notes and emails from Academy Award-winning filmmakers and Pulitzer Prize-winning writers who absolutely loved the film. Every week brings a new surprise fan. Last week it was Bill Gates who was kind enough to write about how much he enjoyed the film in his annual best of the year list. This week it was Dave Navarro of Jane’s Addiction and The Red Hot Chili Peppers. Back in September Ken Burns saw the film and called it “extraordinary.” That’s just three names but it is representative of the diversity of the fan base for this film and book and since that was my goal I’m obviously thrilled. I was fascinated by J.D. 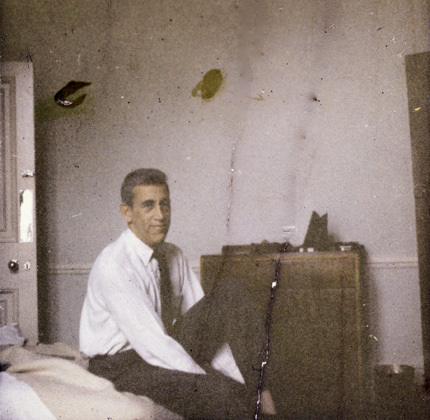 Salinger and I wanted there to be a record of his remarkable life. A large portion of the people that I interviewed have passed away since the film was finished. If I hadn’t interviewed them when I did, those stories would have been lost forever. I really hope people continue to enjoy it and feel that it honors Salinger, but also tells the full story of his life. That was a really hard line. Yes, he’s an extraordinary artist and a deeply complicated human being.